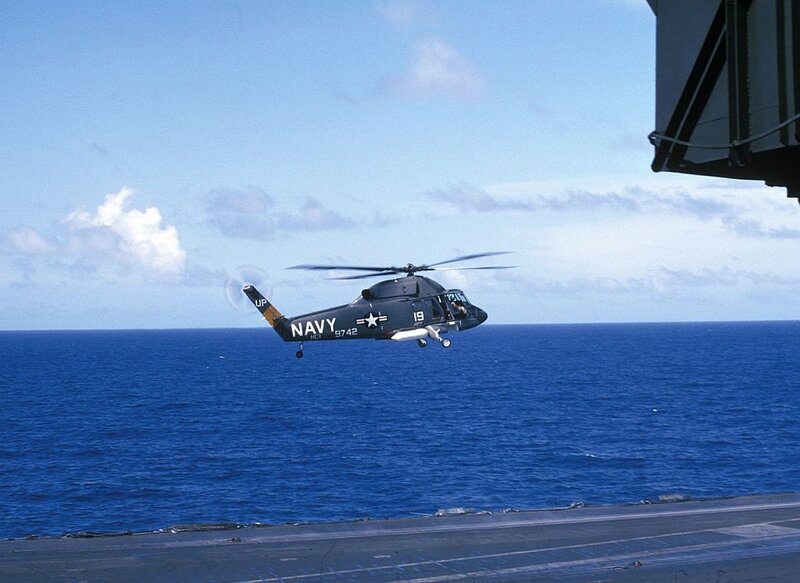 A Kaman UH-2A Seasprite plane guard helicopter (BuNo 149742) of helicopter combat support squadron HC-1 Det. 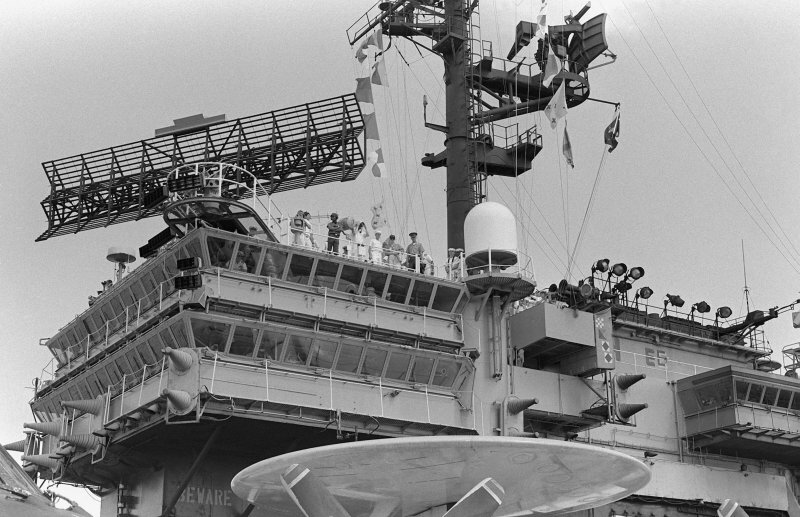 C "Pacific Fleet Angels" hovering over the aircraft carrier USS Kitty Hawk (CVA-63) during a deployment to Vietnam in March 1966. U.S. Navy photo. In the background are two McDonnell F-4G Phantom IIs (BuNos 150481 and 150487) of fighter squadron VF-213 "Black Lions." 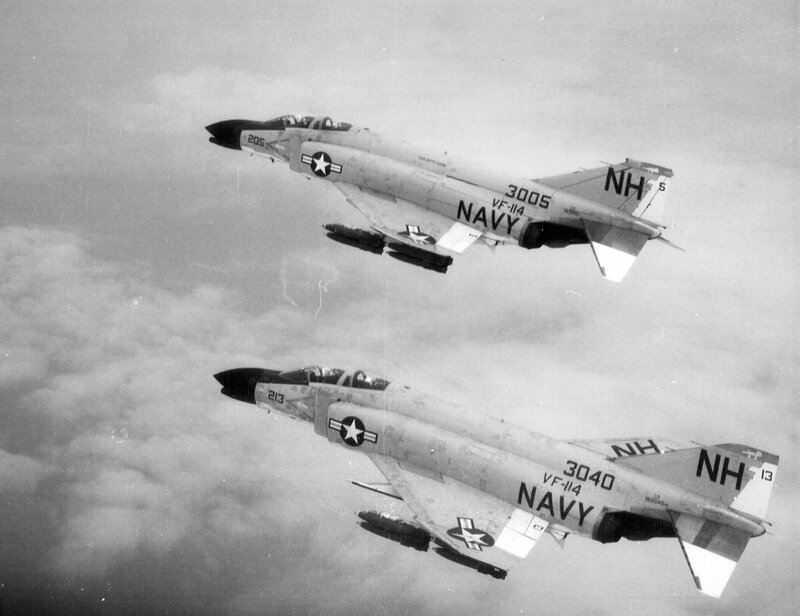 These Phantoms are two of the short-lived USN F-4G's: 12 were converted from F-4B's with AN/ASW-12 two-way datalink communication system and approach power compensator which, coupled with the shipboard AN/SPN-10 radar and AN/USC-1 datalink, allowed hands-off carrier landings. All were later rebuilt as F-4B's. BuNo 140481 was retired as an F-4N on 11 December 1981, BuNo 150487 had been lost at sea due to an inflight fire on 18 September 1972. 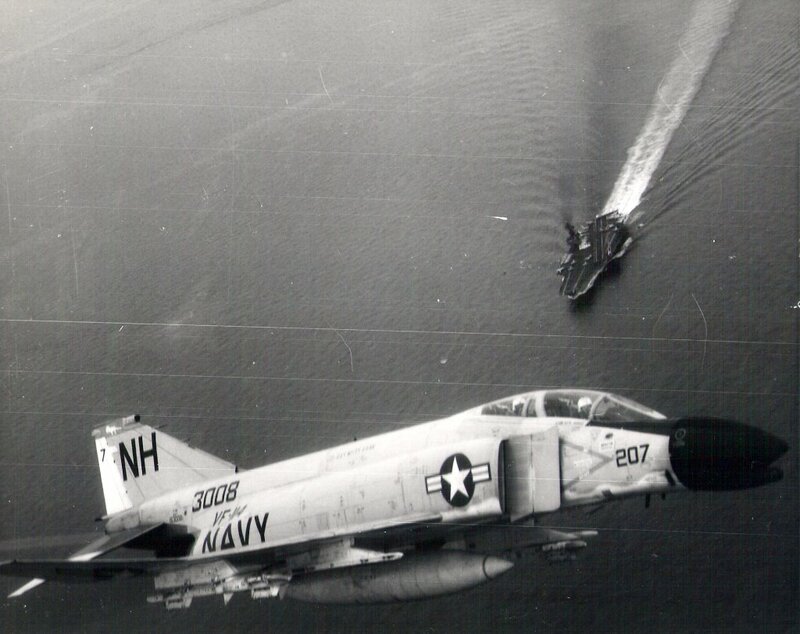 Two F-4B Phantom IIs of VF-114 "Aardvarks" enroute to targets in North Vietnam. Photo is dated 16 April 1967. Photo is dated 28 April 1967. 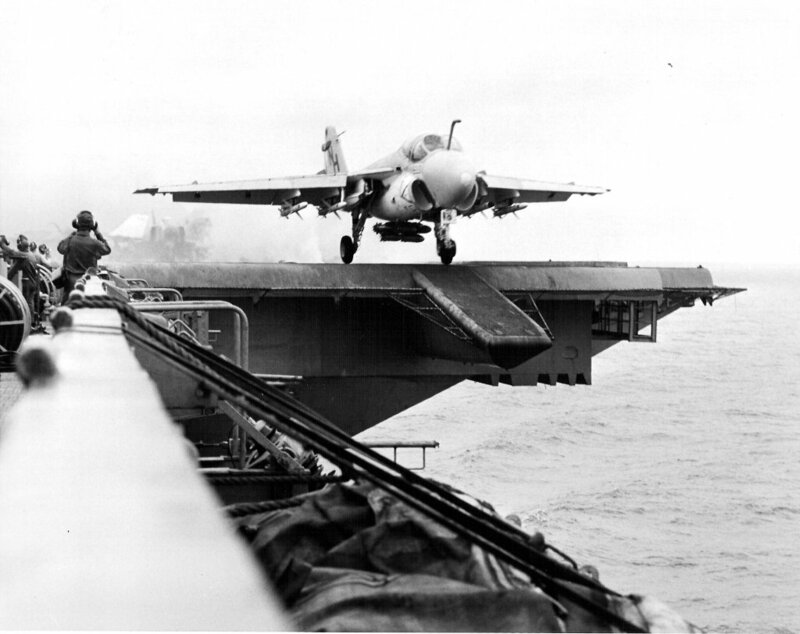 A-6A Intruder, assigned to Attack Squadron (VA) 85 "Black Falcons," launches from USS Kitty Hawk (CVA-63), for an air-attack strike on North Vietnam. U.S. Navy photo # 1122595, by photographer J.W. Bakker, dated 14 May 1967. 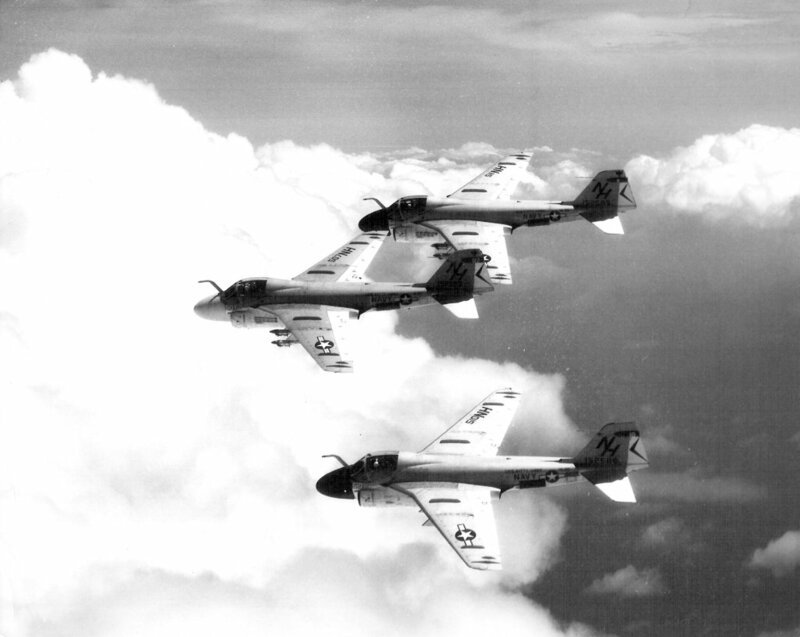 "South China Sea—Three A-6A Intruder aircraft of [Attack] Squadron 85[, 'Black Falcons,'] are returning from a bombing mission over North Vietnam. The aircraft are home based aboard the attack aircraft carrier USS Kitty Hawk (CVA-63)." U.S. Navy photo # 1122702, taken in May 1967 by Reconnaissance Attack Squadron (RVAH) 13 "Bats." 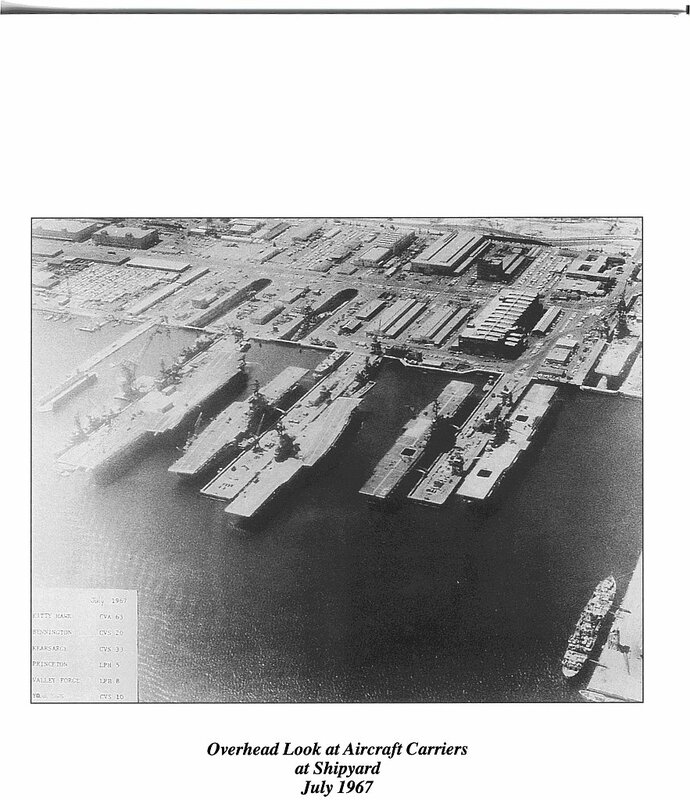 Overhead look at Aircraft Carriers and Amphibious Assault Ships (Helicopter) at Long Beach Naval Shipyard, July 1967. 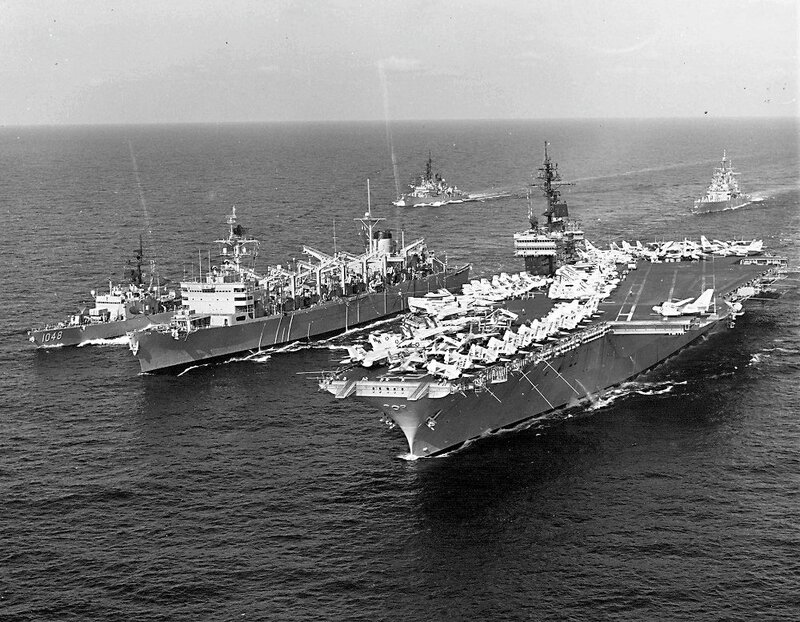 Left to right: USS Kitty Hawk (CVA-63), USS Bennington (CVS-20), USS Kearsarge (CVS-33), USS Princeton (LPH-5), USS Valley Forge (LPH-8), USS Yorktown (CVS-10, top right corner). 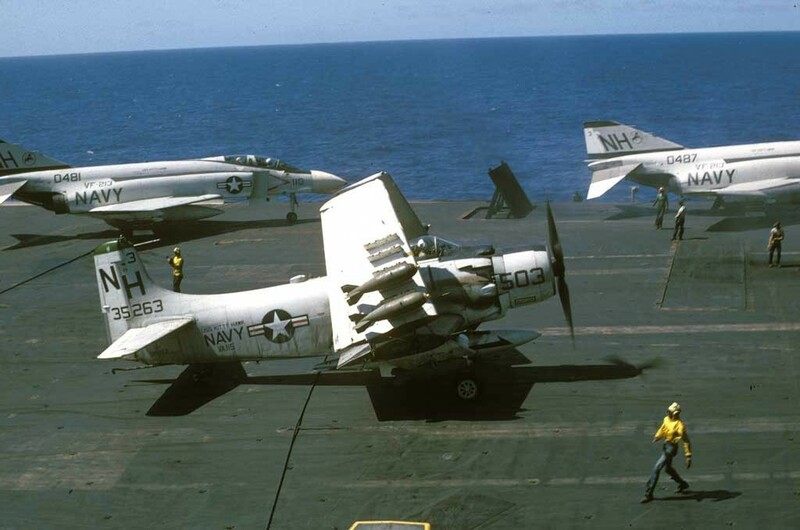 EA-1F Skyraider BuNo 132555 (built as an AD-5N/A-1G night-attack variant), modex VR012, VAW-13 "Zappers," Carrier Air Wing (CVW) 11, deployed with USS Kitty Hawk (CVA-63) for a Vietnam cruise, 18 November 1967–28 June 1968. 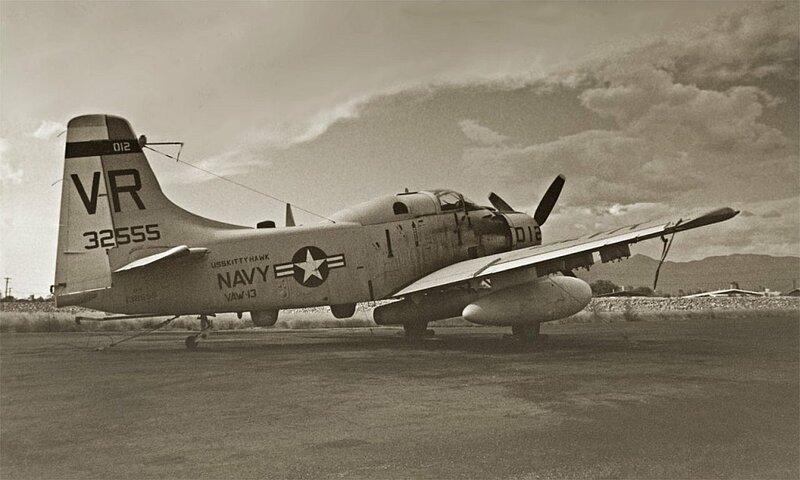 Delivered in October 1954, this aircraft was retired in July 1968. 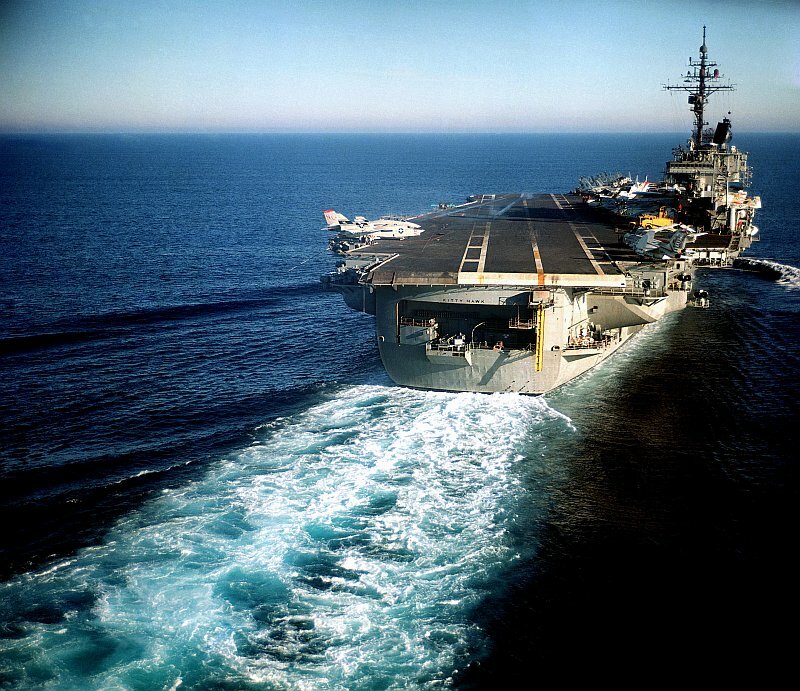 USS Kitty Hawk underway circa 1968, location unknown. USN photo. 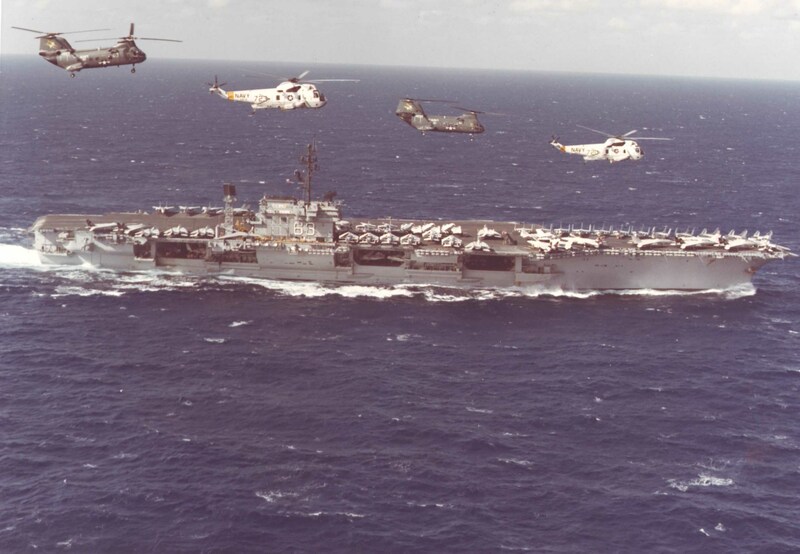 USS Kitty Hawk underway in the Pacific in the 1970s, with four E-2 Hawkeyes and an A-7 Corsair II on the flight deck. 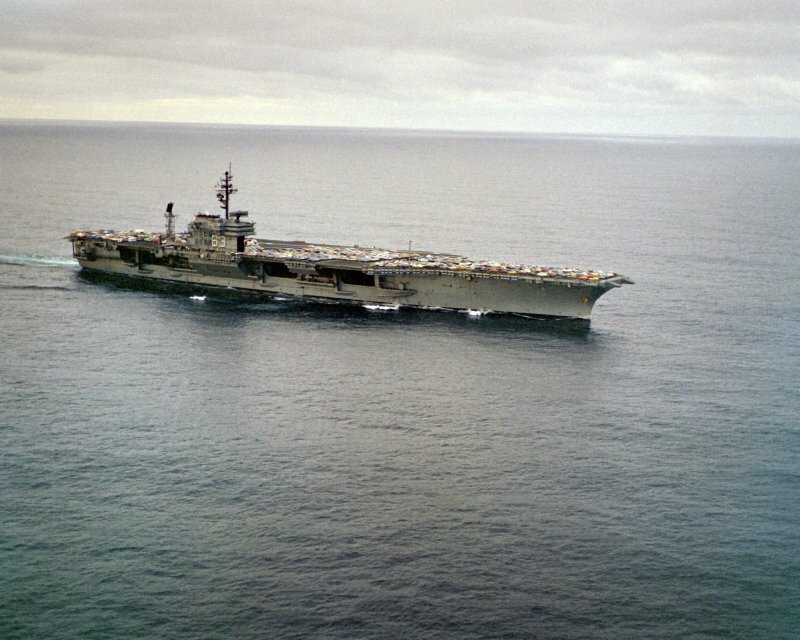 This photo is believed to have been taken on 6 November 1970, as USS Kitty Hawk (CVA-63), with Carrier Air Wing (CVW) 11 embarked, departed North Island, San Diego, California, on her 5th Vietnam War Cruise (6 November 1970–17 July 1971). 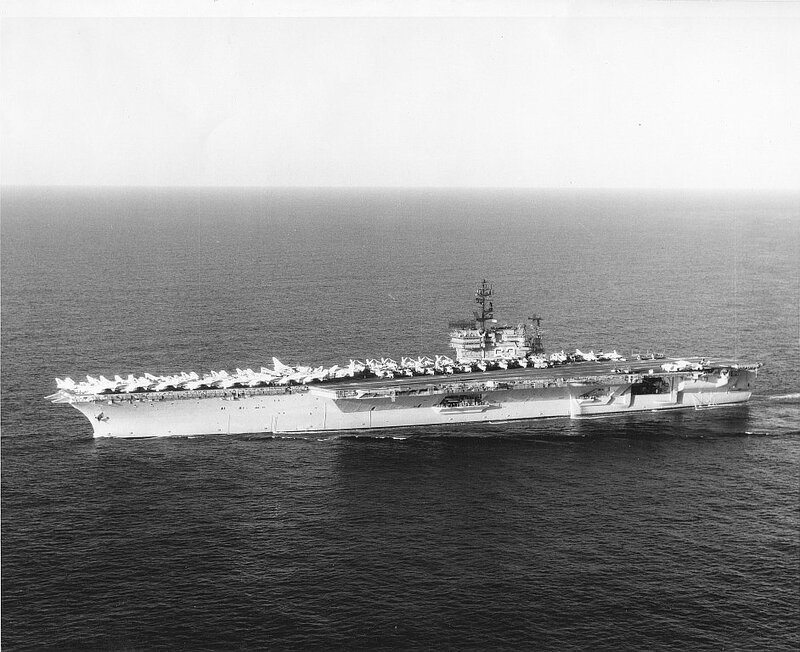 USS Ticonderoga (CVS-14) is astern of Kitty Hawk. 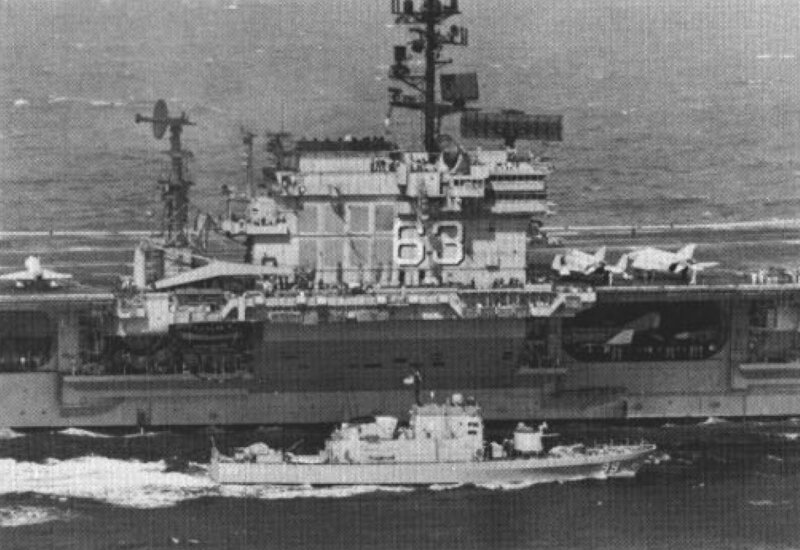 USS Beacon (PG-99) alongside Kitty Hawk (CVA-63). 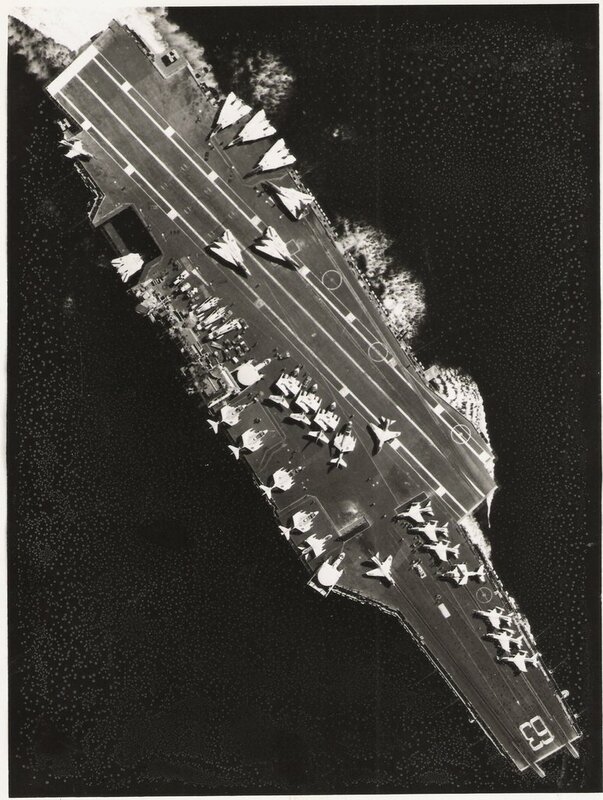 US Navy photo from the December 1970 edition of "All Hands" Magazine. 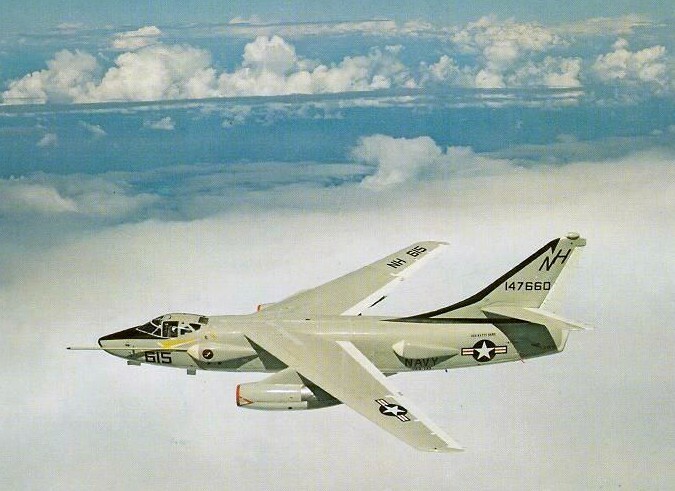 A Douglas EKA-3B Skywarrior (BuNo 147660) of Electronic Countermeasures Squadron (VAQ) 133 "Golden Zappers." 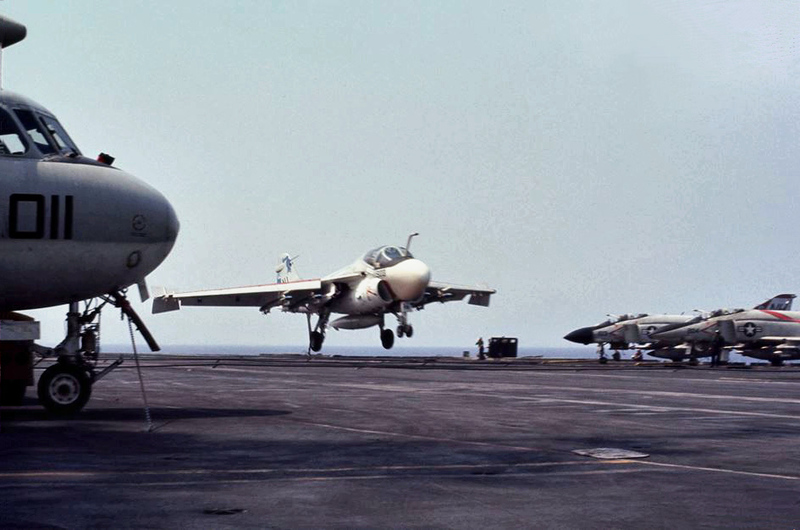 VAQ-133 was assigned to Carrier Air Wing (CVW) 11 aboard USS Kitty Hawk (CVA-63) for a deployment to Vietnam, 6 November 1970–17 July 1971. 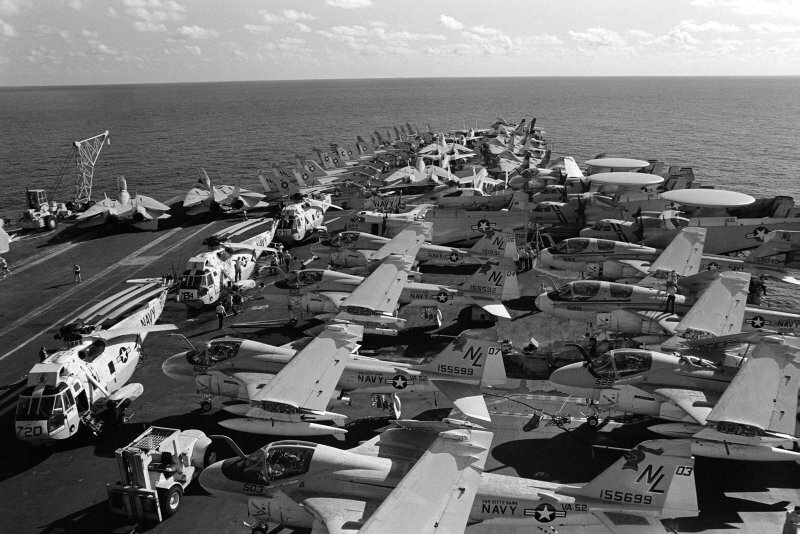 Photo from the Kitty Hawk 1970–71 Cruise Book. Photos by Barry Rowland, who was stationed in Da Nang, via Bob Canchola. 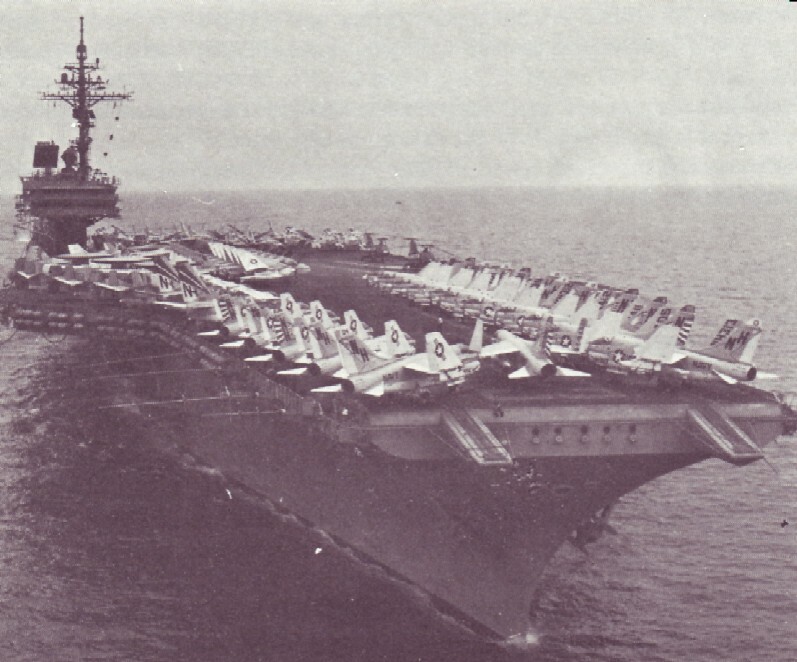 Sixth Vietnam Cruise, 17 February–28 November 1972. Carrier Air Wing (CVW) 11. A-7E Corsair II, modex NH402, VA-195 "Dambusters." 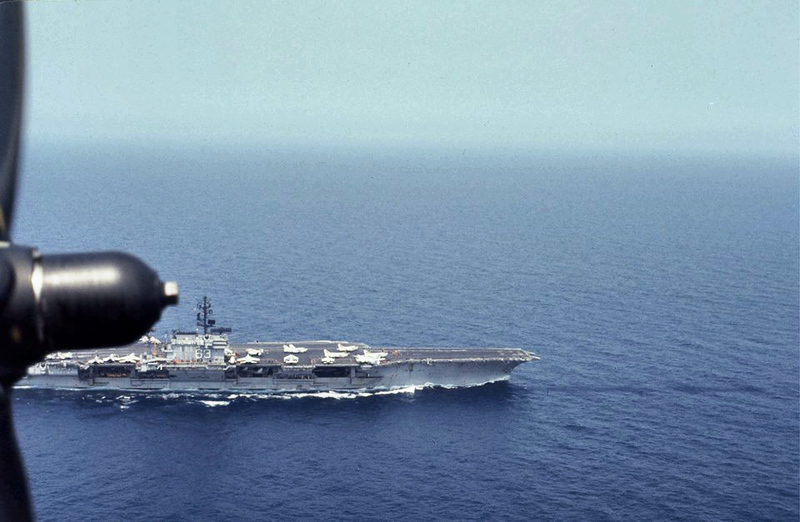 USS Kitty Hawk (CVA-63) as seen from the ship's COD aircraft, C-1A Trader BuNo 136769. 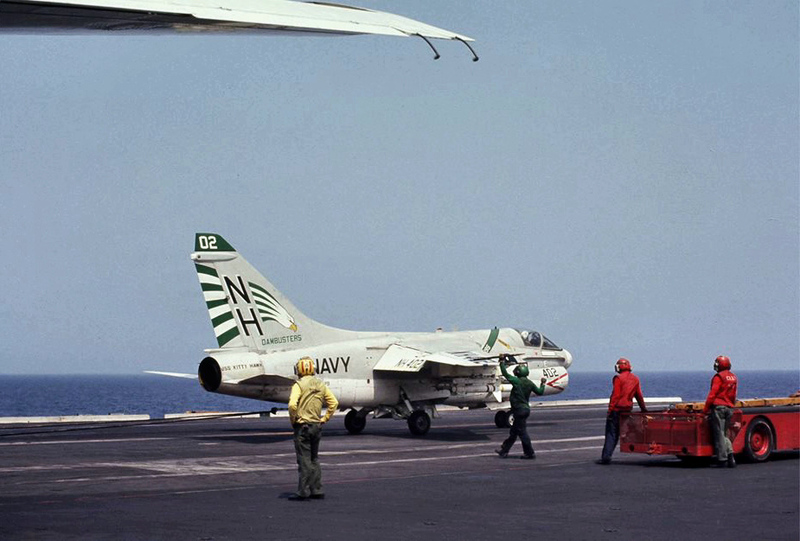 A-6A Intruder, apparently NH503, BuNo 157019, VA‑52 "Knightriders," about to trap aboard. Two F-4J Phantom IIs, one each from VF-213 "Black Lions" and VF-114 "Aardvarks," are on the right. Nose of E-2B Hawkeye, VAW-114 "Hormel Hawgs," on the left. KA-6D Intruder, BuNo 152632, NH516, VA-52 "Knightriders." 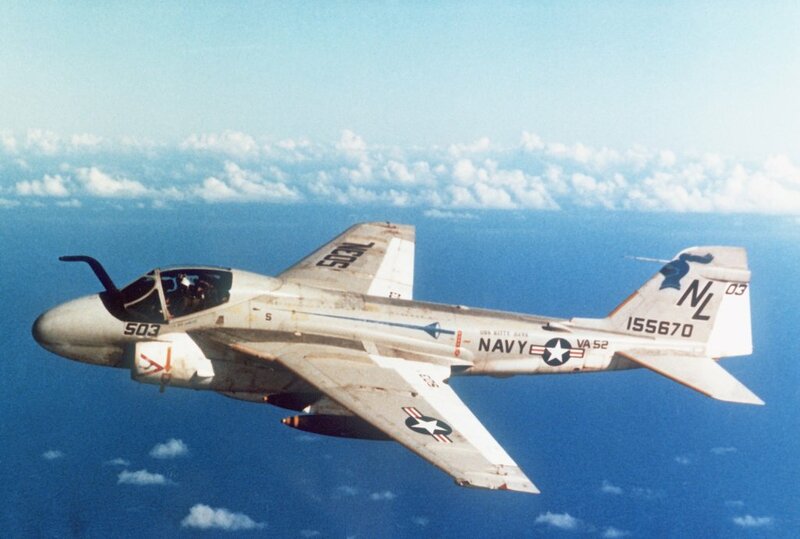 This aircraft was manufactured as an A‑6A, and was lost in the Arabian Sea on 29 December 1979 due to a bad catapult launch from Kitty Hawk (both crewmen, CDR Walter D. Williams, Jr., and LCDR Bruce L. Miller, perished). 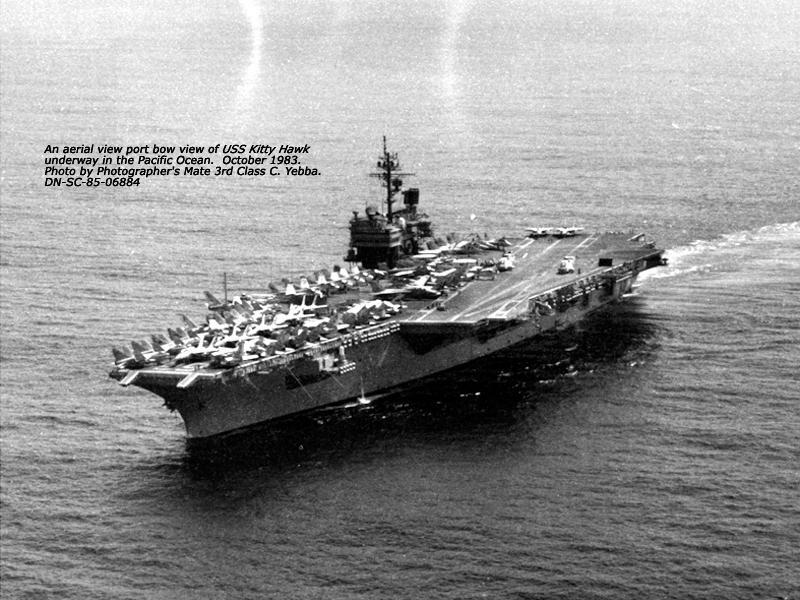 Official US Navy photograph of USS Kitty Hawk underway with Carrier Air Wing 11 (CVW-11) circa 1975, location unknown. 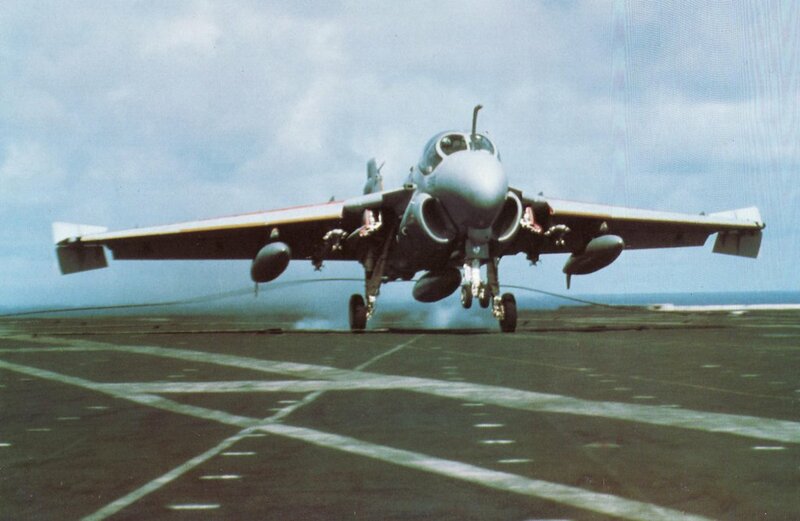 A Grumman A-6E Intruder at the moment of touchdown on board the aircraft carrier USS Kitty Hawk (CV-63), having engaged the third wire to score an "OK, Three" in the LSO's log. The lowered leading-edge slats and wing-tip air-brakes help reduce landing speed. Photo US DoD. Photo and text from Carriers: The Men and The Machines, by David Miller and Lindsay Peacock. 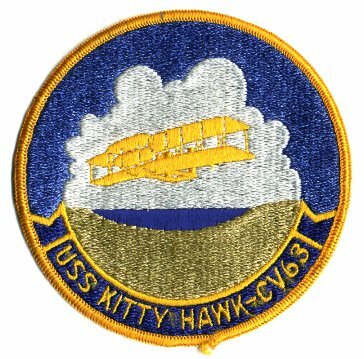 "Attack Aircraft Carrier Kitty Hawk." (From a Russian publication). 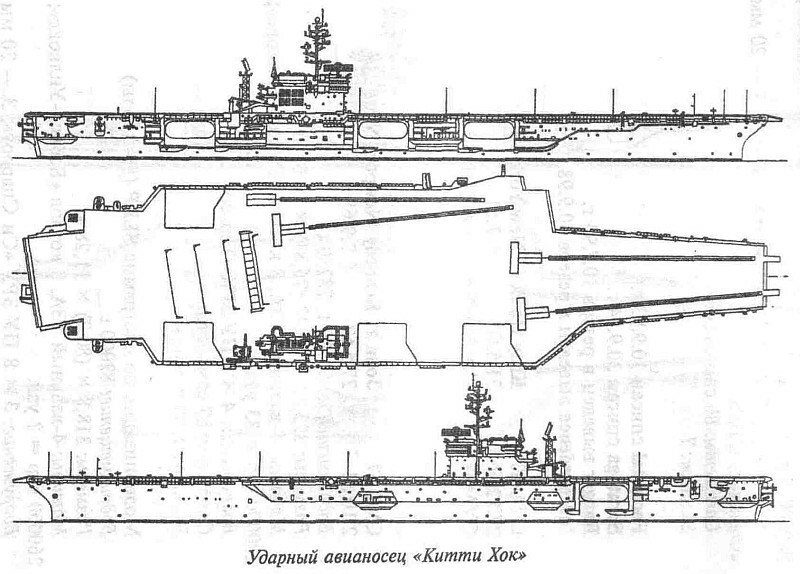 This drawing shows Kitty Hawk in the late 1970s, with SPS-43A and SPS-48C radars and two 8-cell BPDMS launchers. 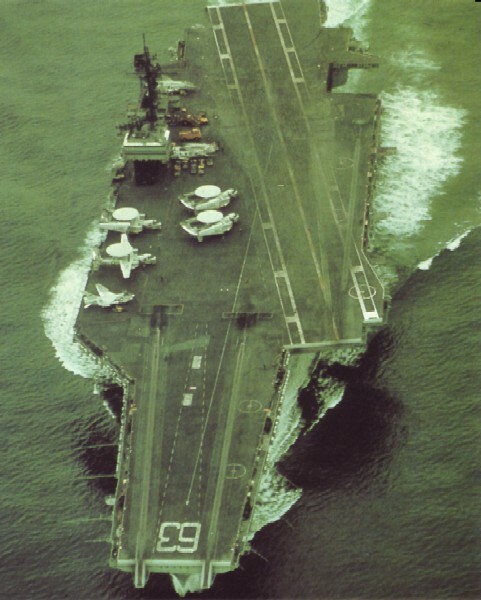 An elevated starboard quarter view of USS Kitty Hawk (CV-63) underway, July 1977. US Navy photo by PH1 A. Legare (DVIC id: DN-SC-86-00162). 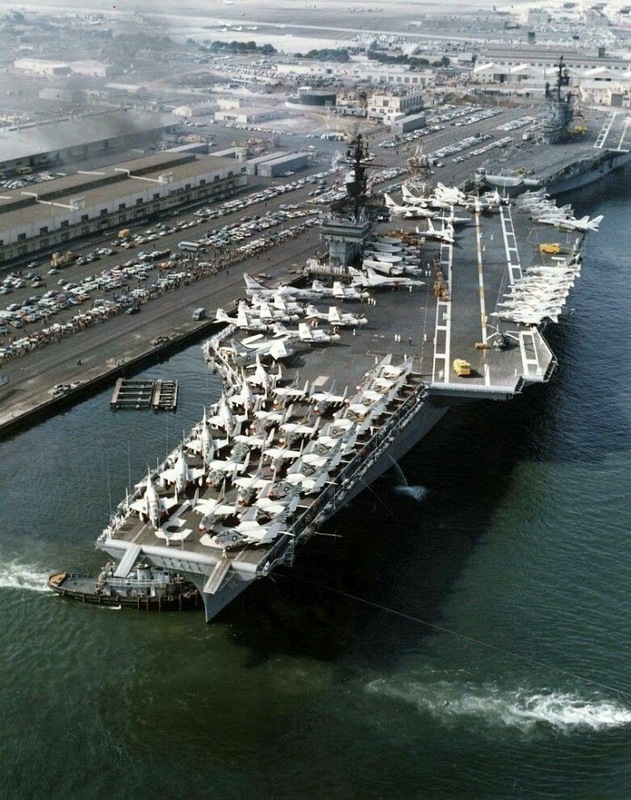 Kitty Hawk departed San Diego on March 8, 1976 and four days later entered drydock at Puget Sound Naval Shipyard in Bremerton, WA, to commence a 100-million dollar complex overhaul scheduled to last 12.5 months. This overhaul configured Hawk to operate with the F-14 Tomcat and S-3A Viking aircraft in a total CV sea control mode. This included adding spaces for storage, ordnance handling and maintenance facilities for the two aircraft. Also included in the work package were more efficient work areas for air frames and a repair facility for ground support equipment and the addition of avionics support capability for the S-3. 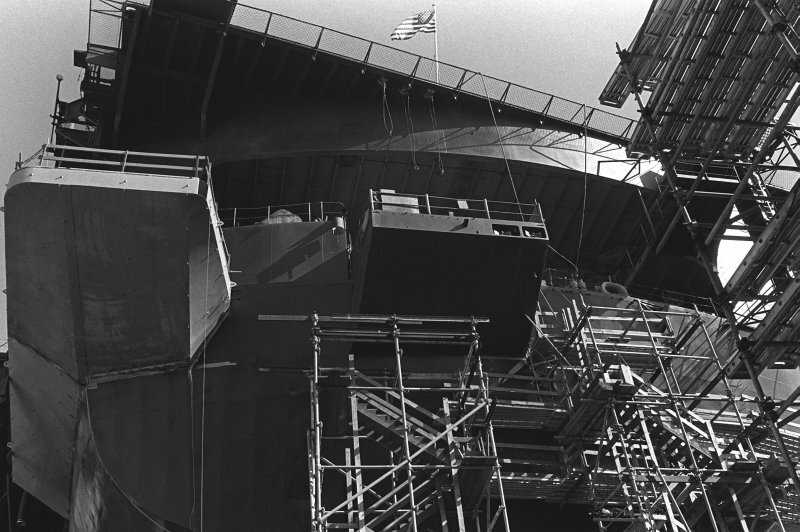 The ship also replaced the Terrier Surface-to-Air missile system with the NATO Sea Sparrow system, and added elevators and modified weapons magazines to provide an increased capability for handling and stowing the newer, larger air launched weapons. 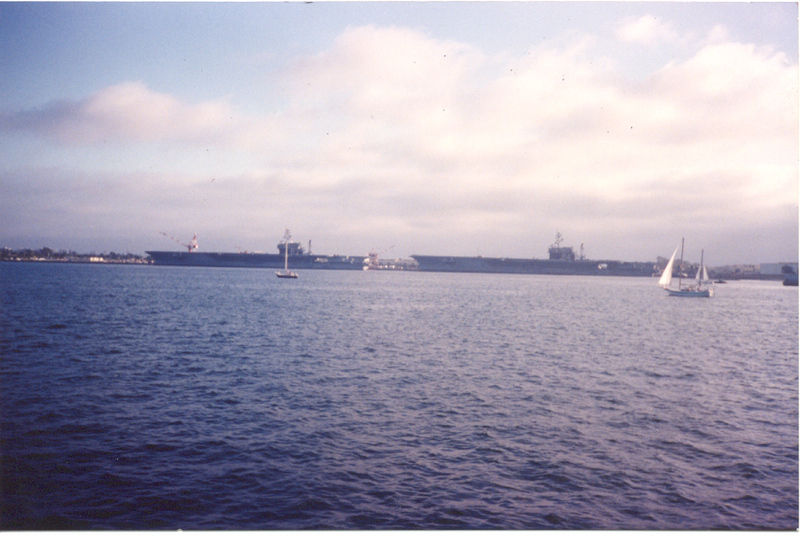 The carrier completed the overhaul in March 1977 and departed the shipyard April 1 of that year to return to San Diego. 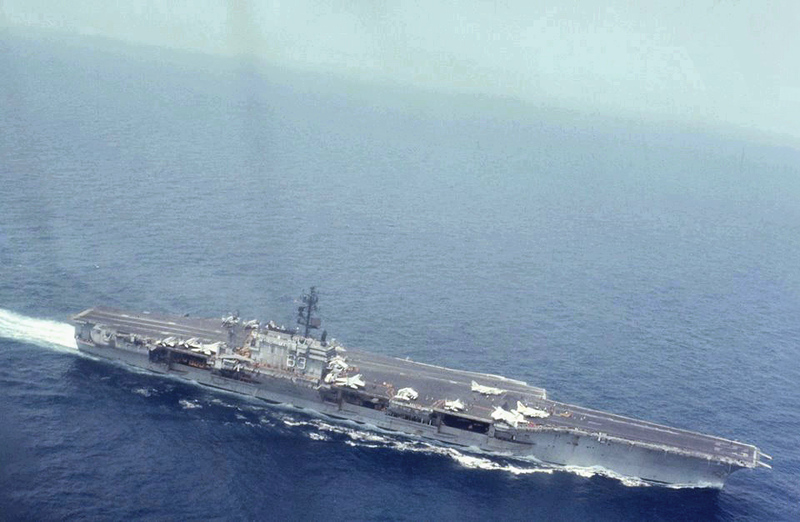 USS Kitty Hawk (CV-63) underway with Carrier Air Wing 11 (CVW-11), circa 1977–1978, location unknown. USS Sacramento (AOE-1) simultaneously replenishes USS Sample (FF-1048) and USS Kitty Hawk (CV-63), while underway in the Pacific Ocean, 16 March 1978. USS Goldsborough (DDG-20) and USS Bainbridge (CGN-25) are steaming astern. National Naval Aviation Museum photo, # 1996.488.104.052. 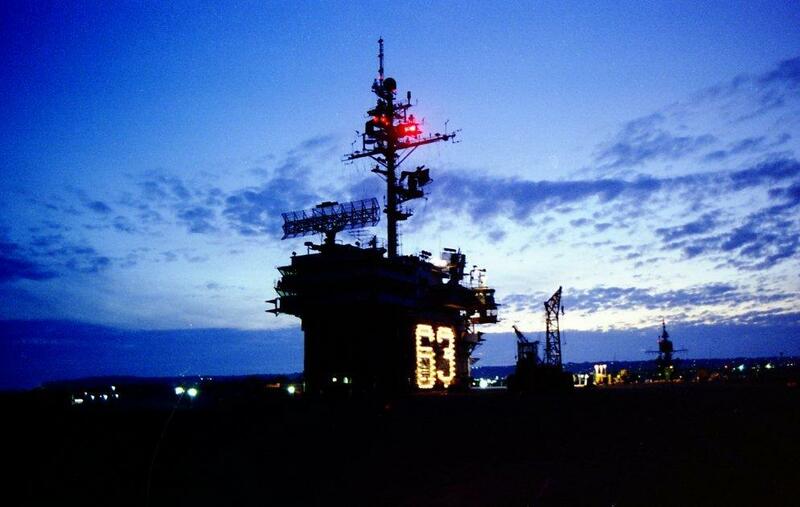 Mike Green, Port Angeles, Wash.
USS Kitty Hawk (CV-63) island structure at dusk, circa early 1979, at NAS North Island. 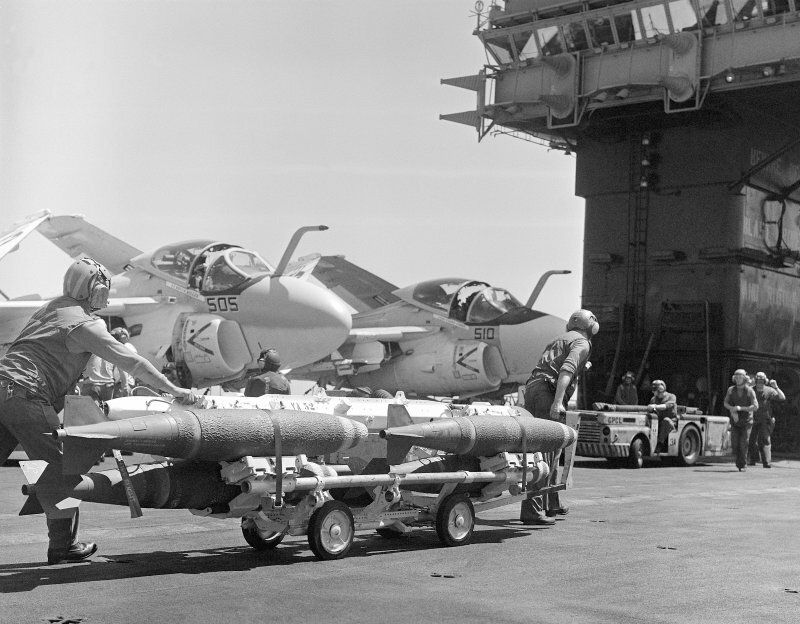 Two crewmen move Mk-82 500-pound bombs past two parked A-6 Intruder attack aircraft during flight deck operations aboard USS Kitty Hawk (CV-63), 1979. US Navy photo by ENS A. Legare (DVIC id: DN-SN-85-11093). 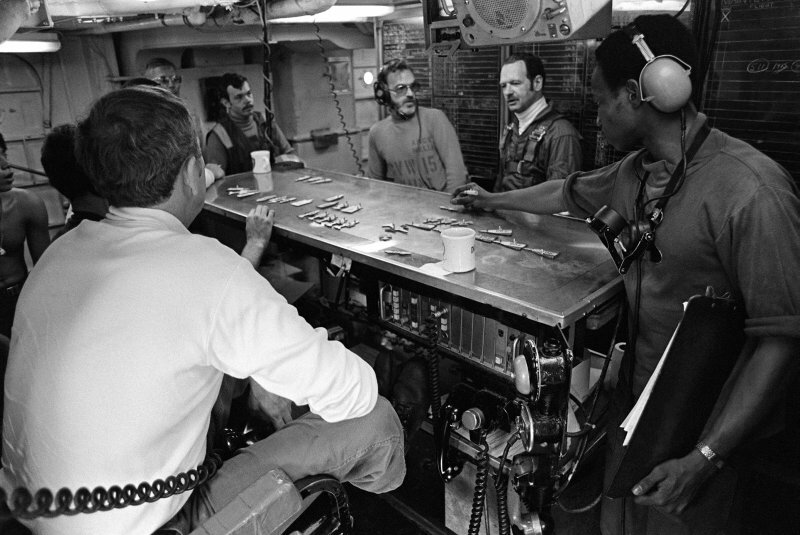 Crewmen inside the flight deck control center aboard USS Kitty Hawk (CV-63) use a table to simulate the arrangement of aircraft on the carrier's flight deck, December 15, 1979. US Navy photo by PHC Ken George (DVIC id: DN-SN-85-06358). 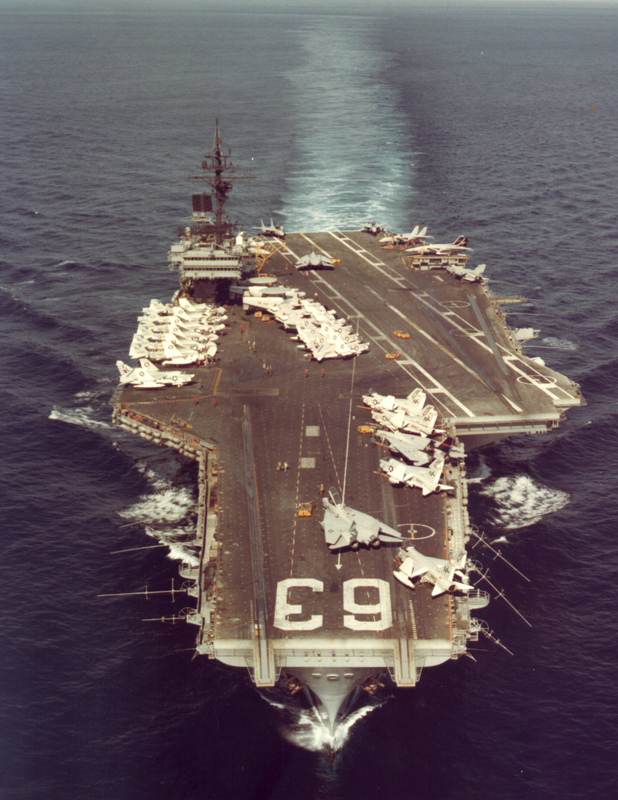 USS Kitty Hawk (CV-63) underway in the late 1970s–early 1980s. 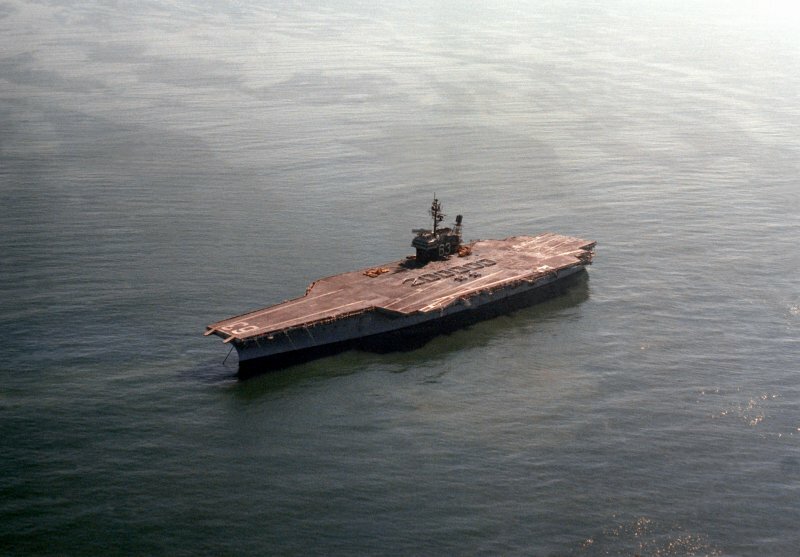 USS Kitty Hawk (CV-63) underway, circa 1981. An excellent, direct overhead shot from about 1500ft. 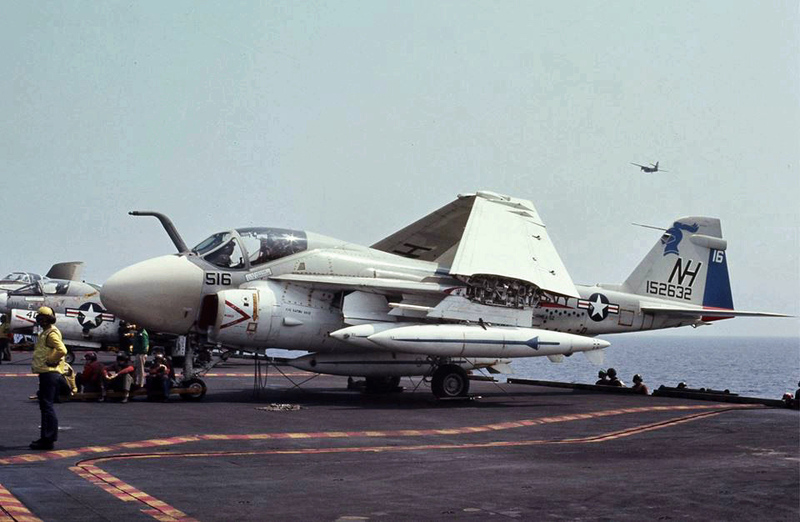 A Grumman A-6E Intruder (BuNo 155670) from Attack Squadron (VA) 52 "Knightriders," part of Carrier Air Wing (CVW) 15, in 1981. Official U.S. Navy photo, available from DefenseImagery.mil (# DN-SC-84-05437). Although dated 15 January 1984, this cannot be correct. 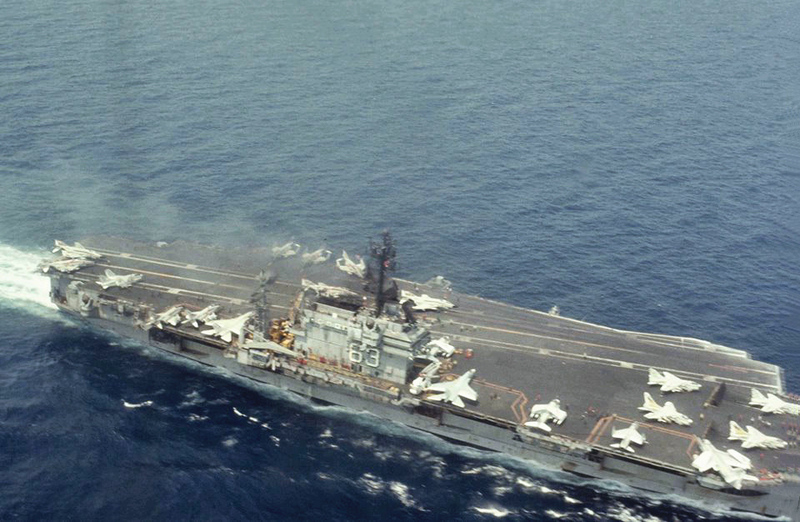 BuNo 155670 wore modex NL503 for just one deployment to WestPac with USS Kitty Hawk, 1 April–23 November 1981. 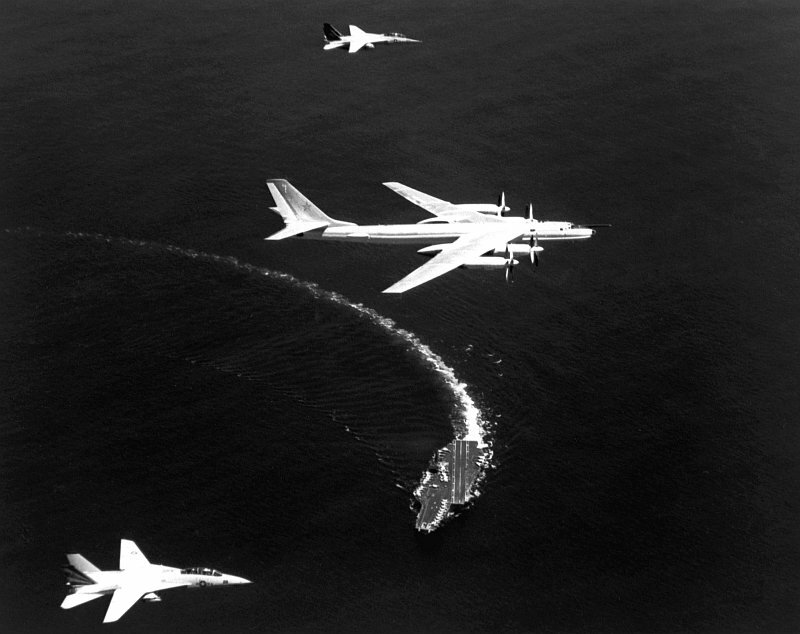 In 1984 VA-52 and CVW-15 were teamed with USS Carl Vinson (CVN-70), and 155670 was no longer attached to the "Knightriders." BuNo 155670 was manufactured as an A-6A, later upgraded to the A-6E standard, and was sunk as an artificial reef after its retirement. 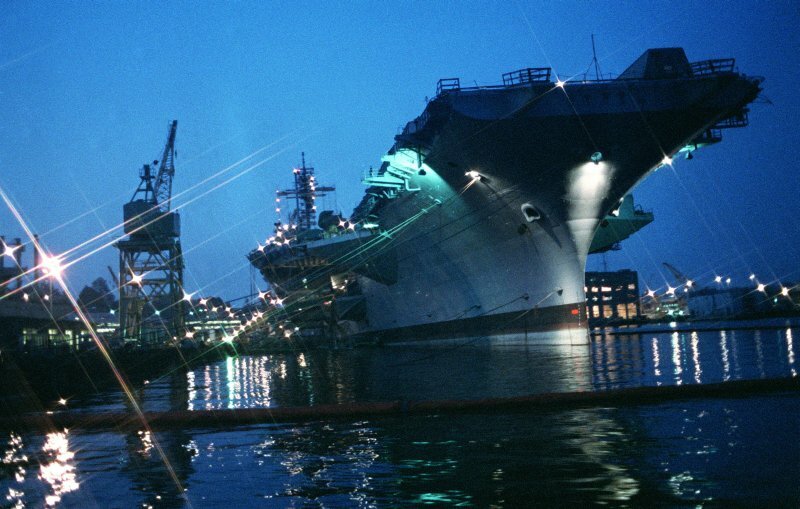 USS Kitty Hawk (CV-63), left, and USS Constellation (CV-64). NAS North Island, San Diego, Calif., circa 1984. Richard Miller BMCS USNR Ret. 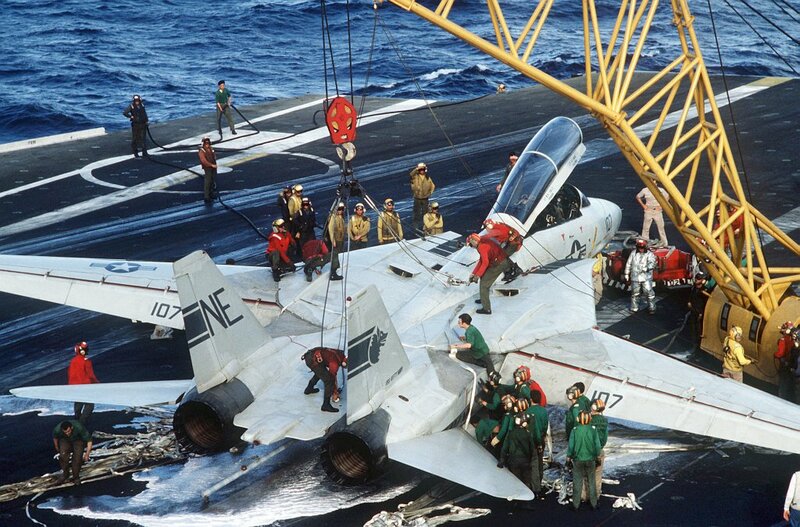 A barricade restrains an F-14A Tomcat (BuNo 161296, modex NE107) from VF-1 "Wolfpack" during an emergency landing aboard USS Kitty Hawk (CV-63), 30 June 1984. 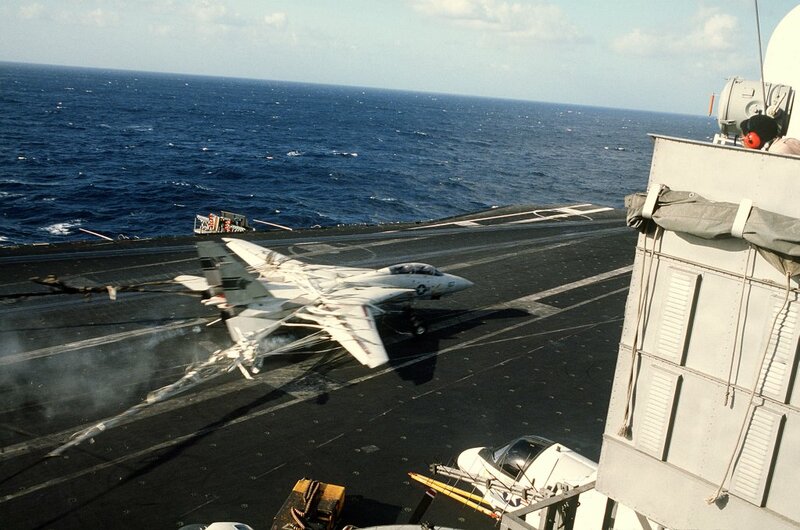 The Tomcat had to make a barricade arrestment due to a sheared starboard strut. The recovery was successful; no injuries were sustained. U.S. Navy photo by PH3 Hall, available from DefenseImagery.mil (# DN-ST-87-11416). U.S. Navy photo by PH3 Hall, available from DefenseImagery.mil (# DN-ST-87-11420).